We have come up with a lot of ideas in every field, such as bio-battery, waste oil detection, transformation of Metarhizium to kill cockroaches, sewage treatment and so on. But we can't quite determine whether these projects are acceptable to the public, and whether they are actually what they really need. We need to collect information about the public's views on these ideas and to understand the actual needs of the public, and then make a choice. Among the many participating teams, we also need more feedback from peers and professionals in the topic selection and experimentation. When we have an alternative project, we can't quickly find out if other teams are doing similar work and go through a feasibility study of the project. In the course of our experiments, we can't get timely feedback and suggestions about improvement, which is easy to be limited to our own ideas, causing unnecessary waste of time and energy. In China, most people have misconceptions about synthetic biology and genetic modification. Most people think that synthetic biology is harmful and refuse to accept genetically modified products, especially food products. However, there is currently no platform for normal publicity and exposure to synthetic biology in the country. The public has little understanding of synthetic biology, and they naturally contradict this product. In this way, when our project is going to conduct extensive public research, it is also difficult. To solve these problems, we intend to increase communication and exchanges of the participants and create a new systematic HP platform. 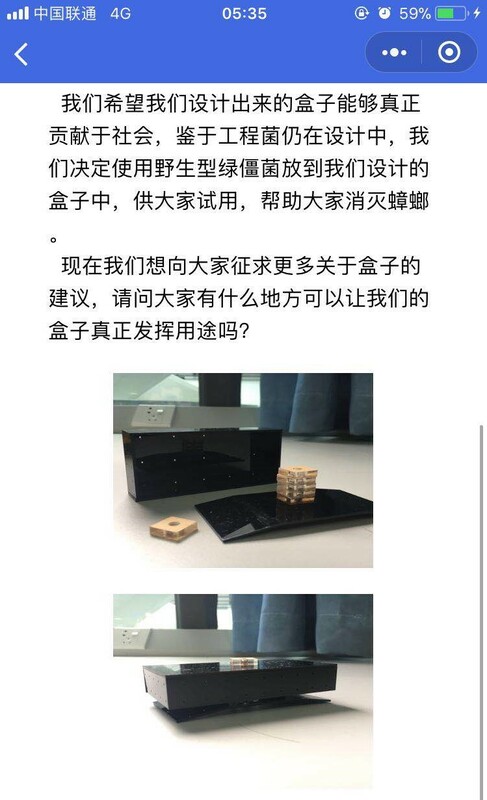 It is a software that is installed on the chat software WeChat (a software used by almost everyone in China). 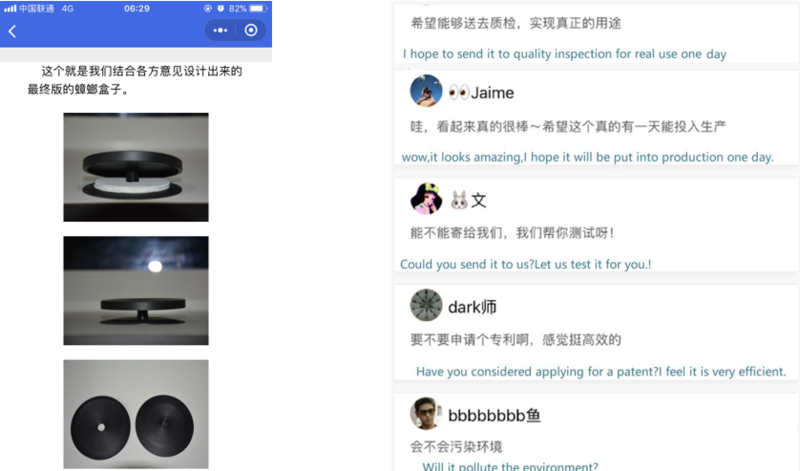 Our applet integrates the advantages of WeChat. So you don’t need to download another app. While using our software, you can also chat with friends, purchase movie tickets, play mini games and so on. It is a new-concept software that can be used regardless of the system’s mobile phone. 1. We hope this will be the HP platform for iGEMers, providing a platform for online communication and collaboration between teams, and get public participation and feedback for project improvement. From the perspective of the entrants, each iGEM team is in the process of conceiving and selecting topics at the beginning of the competition. Compared with traditional cross-regional meetings and exchanges, we hope that each team can communicate more conveniently and on time online, no longer limited by geography and time. 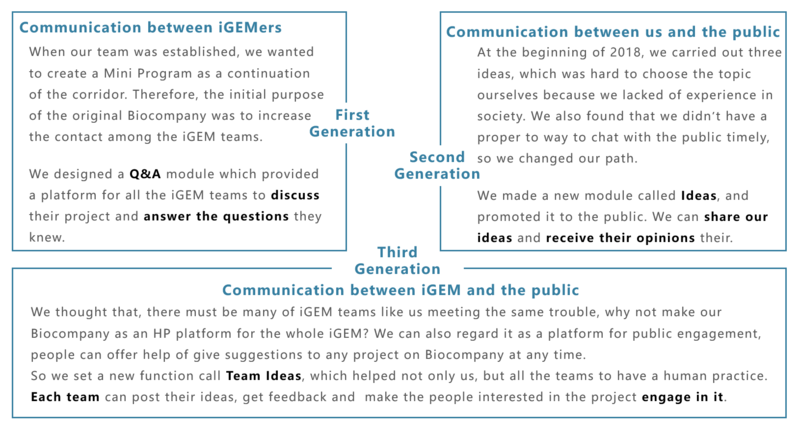 Receive feedback and suggestions from within the various IGEM teams to achieve timely sharing and communication. Most iGEM projects are linked to the actual situation, and the details and scope of application need to be adjusted in time during the experiment. This requires timely identification of the group targeted by the project, allowing potential users to participate in our projects. Product experience, testing and feedback from online to offline. We continually correct and adjust our projects based on their feedback. 2. We hope that the iGEM team will not only stop at the iGEM competition, but also find follow-up support and motivation in this platform, continue to improve the project, and truly let synthetic biology benefit humanity. For the iGEM team, many of their projects are stopped at iGEM and rarely progressed. The reason may be that the system is not mature enough to find sufficient financial support. We hope that the iGEM team on this platform will be able to find like-minded teammates who also have a deep understanding of certain projects or have professional knowledge. Through the exchanges with teammates who share the same goals, we can improve the project and develop together. At the same time, through our platform, perhaps projects can be favored by potential users and investors. If you have the guidance of a professional entrepreneurial team or support in product development, I believe that there are many projects that can go on and make practical and useful things. We hope to use the platform of the applet to carry out good projects and truly apply synthetic biology to our real life, and also add a force to synthetic biology. 3. For many synthetic biology researchers, we hope that their efforts will match the attention they receive, allowing them to better study synthetic biology. For many of the more controversial and unpopular research fields, the researchers often do not receive the attention and attention they pay. Synthetic biology is such an area. In China, because the public is more resistant to GM products, the research and the public are almost lost. Researchers often cannot judge whether the results he has worked hard to make are the real needs of the public, or the pseudo-demand he imagines. The lack of public knowledge of synthetic biology further expands the communication barrier between the research team and the public, and thus a large number of scientific research results are not happy or even dare to use. Even more frightening is that social media is full of a large number of pseudo-sciences. Some of them are well-known for their traffic sensationalism, and they are alarmist to promote some wrong scientific knowledge and opinions, which cause great trouble to the public's scientific cognition. However, we can use this applet to keep our scientific research projects in a more succinct and easy-to-understand manner while keeping scientific rigor, and let the public better understand what we are doing. The public can participate in the project in time to truly understand the real part of the experiment. This will provide a bridge of communication between researchers and the general public, which will better attract the public to understand and accept the knowledge of synthetic biology. Let synthetic biology researchers get more support and help. 4. We hope that people will have the opportunity to learn more about synthetic biology, reduce misunderstandings in synthetic biology, and further promote the development of synthetic biology. 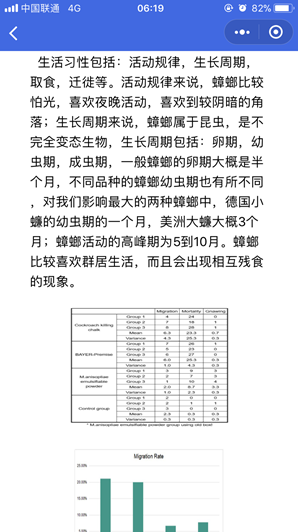 There are many misunderstandings about transgenic and synthetic biology in China. Synthetic biology like plague is generally feared and evaded. We hope to use some successful projects and cases to carry out scientific popularization of synthetic biology for a large number of potential users. If the public can learn more about synthetic biology, be able to participate in discussions about synthetic biology and give timely feedback, they may change the original idea of resistance to synthetic biology. Therefore, there is more concern and support for the research and exploration of synthetic biology. At the mid term of our project, we wanted to have a closer contact with the public to make our whole project reasonable and comprehensive. Therefore, we posted our recent works to the applet and looked for the possible human practice. 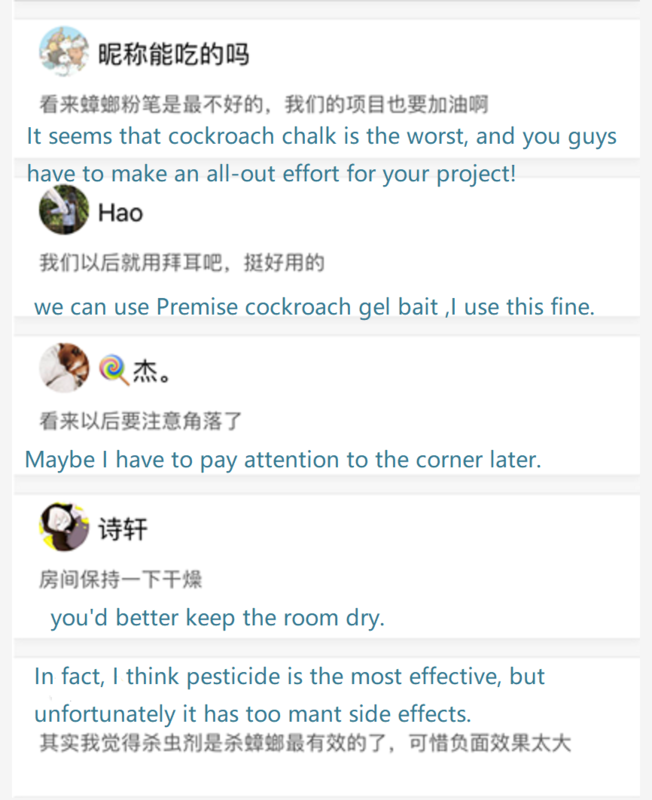 After posting, a teacher from Yueliangwan Primary School made a phone call to us for a science popularization and we found a suitable place to offer our help to prevent cockroaches and test our application. Fortunately, we have some fans that are quite interested in our cockroach project. At first they ask us many questions for they know little about that. After they had a general understanding of our project, some of them even gave us a litter bonus to support us. When our Green Ground finally came out, they gave us suggestion to make it better used in the house. Q: As a person who knows nothing, how do I participate in advanced technology and give advice? A: You can just click on an article on this page, or read the idea that the article belongs to. 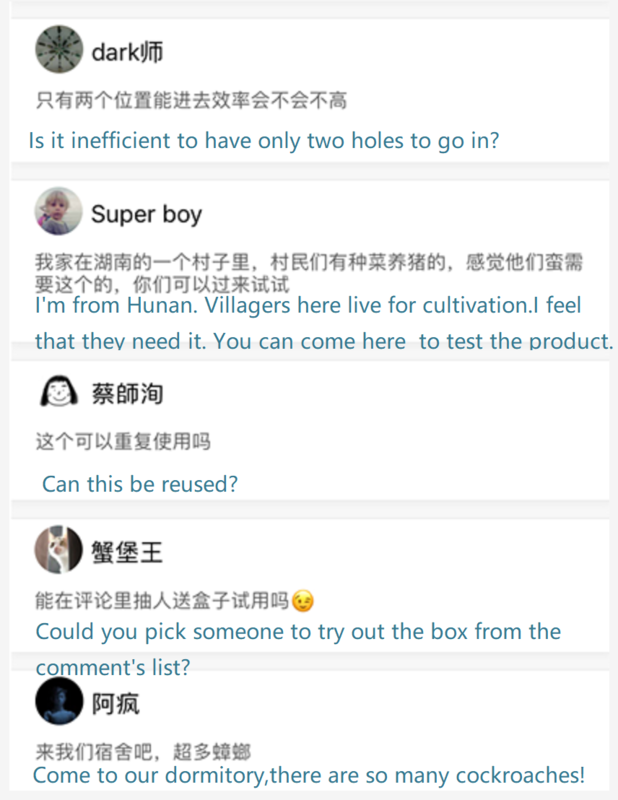 This is an HP platform for the public with popularization of science.You can easily understand and comment on the response. Q: I can just read articles in technical magazines. Is it really necessary to use your app? A: Reading technical articles is only an one-way output for the public, without participation. If you use our mini program, you can join in the whole process of R&D. Each of our teams has a reward code. If you like this idea, you can give advice and sponsor it. So this product may develop in the way you want, developing the technology product that suits you. Just like raising a child. You can read all kinds of scientific articles without downloading any app. You can also contact with expert for free. If your child uses it, it may become the enlightenment of his academic career. 2. It is a systematic platform for academic communication and is the output platform for iGEMers. In this interface, each team can register a team ID, which is independent of the individual’s ID, so that it can be passed down year after year. In this, the team can publish ideas, and each idea has a lot of article’s descriptions and records. It is a platform that can systematically present its team culture and projects. These articles are not only for the public, but also for every iGEMers, where you can systematically read each team’s projects and their progress and problems. You can also comment, provide help and cooperate. 3. It is the connection between all walks of life. Shown below is the forum page, where you can post and respond to various posts. You can create a topic that belongs to you and find your own fun whether you are a citizen or a researcher. You can also ask questions, even roast your research life. This is a free platform, that we make room for users, and they will create different values. 4. In this page, you can edit your personal information. You can also review the article or the topice you have followed.